The Google Pixel 3 and Pixel 3 XL are expected to launch in October but looks like we will be having every single detail related to both the devices even before the official launch. We already know how both the phones look like, thanks to all the previous leaks. In case you haven’t seen the design yet, make sure to check the CAD-based renders from OnLeaks and the set of hands-on images of the Google Pixel 3 XL that surfaced a few days back. 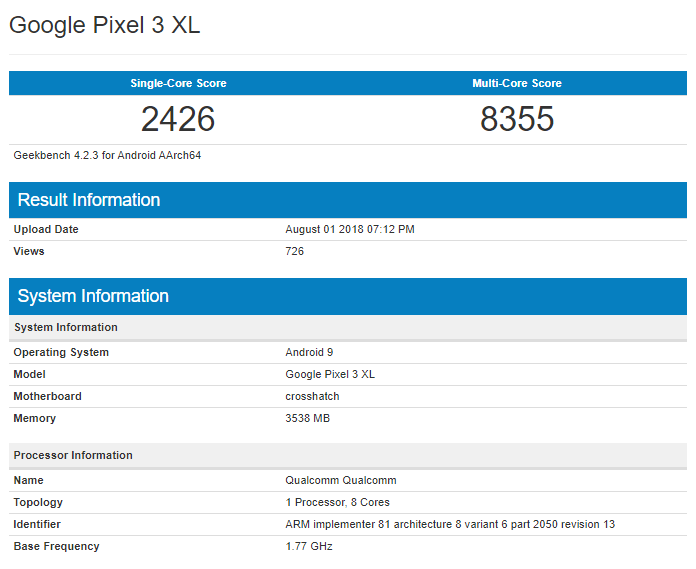 Today, the Google Pixel 3 XL, codenamed ‘crosshatch,’ showed up on Geekbench which revealed a couple of its specifications. The Pixel 3 XL benchmarked on Geekbench has 4GB RAM and is powered by the Qualcomm Snapdragon 845 chipset. It was expected that we will see only 6GB RAM variant of the Pixel 3 XL but seems like Google is sticking with 4GB RAM for its bigger device this year as well. The Android version is ‘9’, meaning that Google Pixel 3 XL runs on Android P out of the box. There is nothing ‘mind-blowing’ when we talk about the benchmark scores. The phone scores 2426 on the single core and 8355 on multi-core, which is similar to what other phones with Snapdragon 845 score on Geekbench. Just like last year, we are expecting great camera hardware and software on both the Pixels. The last year’s Pixel 2 phones are still one of the best when it comes to cameras, and we expect more from this year’s Pixels. If you don’t know, there is still a single rear camera setup for both the Pixel 3 and Pixel 3 XL, but the phones have dual front-facing cameras this time. This time, we are expecting to see Wireless Charging as well. What are your expectations with the Google Pixel 3 and Pixel 3 XL? Do let us know via the comments section.